Personally, I felt that this episode of “Game of Thrones” did what it had to do. Bran’s (Isaac Hempstead-Wright) brief visions provided a glimpse into the past and the future, Arya (Maisie Williams) finally decided to leave the Faceless Men, and two very influential characters returned to the fold – Walder Frey (David Bradley) and Benjen Stark (Joseph Mawle) respectively. I felt that the writers handled these moments well, and although Sam’s (John Bradley) extended sequence made the episode a lot worse than it had to be, it didn’t ruin it for me. The problem with this aforementioned scene wasn’t the quality of the acting – as has been suggested – but rather that Sam as a character doesn’t deserve this kind of attention in the first place. He’s always been one-dimensional, but previously this has been masked by his endearing friendship with Jon Snow (Kit Harington). Now Sam doesn’t have that mask, so to spend twenty consecutive minutes with him is jarring. It was a shame that we spent so much time with Sam after one of the best Bran scenes of the series to date, because the episode started on a high and then fell flat. Bran’s visions might’ve required several watches to fully appreciate, but when you’ve paused your TV enough times to catch each one separately they become a brilliant flicker of “Game of Thrones” past, present, and future. The shadow of a dragon passing over King’s Landing, a burst of wild fire, the Mad King shouting the phrase ‘kill them all’; what more could you ask for? Then there was the return of Benjen Stark, a character who we haven’t seen since the third episode of the entire series, so “Blood of My Blood” started in a very strong way. It was a pulsating, atmospheric, speculation-building beginning to the episode, and it deserved better than to be proceeded by Sam’s journey home with his girlfriend. Still, for my money these moments left the episode in a reasonably positive place. There was a scene involving Tommen (Dean-Charles Chapman), Margaery (Natalie Dormer), and The High Sparrow (Jonathan Pryce) wedged in the middle if we’re following the script properly, but in all fairness this scene didn’t really have much of an impact on the episode. The main reason that it was forced in was to set up the plot twist later on involving the same characters, and to provide the audience with an insight into Margaery’s head space, so on its own it wasn’t very interesting. When Sam’s scenes were finally over the episode shifted to a more exciting place – Braavos. Arya went to see the play again, and this time we got to see a later scene in which the actors were portraying Joffrey’s (Jack Gleeson) death at the Purple Wedding. Once again I really enjoyed watching the play, not only because the dialogue was poetic and well-written, but because it offered a new perspective on events that we’ve already seen. The actress playing Cersei (Lena Headey) in the play, Lady Crane (Essie Davis), spoke of her pain and anguish at the loss of her first child which we’ve never really seen from the real Cersei. We know that she feels a great deal of sadness, but she puts her energy into vengeance and malice rather than self-pity, so having Lady Crane act as she did allowed the audience to empathise with the real version of the character a little bit more, and also did the same for Arya. Of course, this scene had to move the plot forward, and it definitely did. Arya couldn’t kill Lady Crane because she still has a very clear sense of right and wrong, and also because having had the chance to speak to the actress in this episode she realised that the two might have more in common than she thought. This realisation was enough for Arya to give up her chance at becoming ‘No One’ and face a fight for her life against The Waif (Faye Marsay). We all knew that this was coming, but I do find it slightly frustrating that Arya gave up her chance to live a safe life for the sake of a woman that she barely knows. I understand that in reality Arya’s decision was made for herself, for the sake of the person that she would be giving up if she killed an innocent woman, but perhaps the target could’ve been a more personal one for Arya so that the storyline would’ve been more believable. If Arya had been tasked with killing a friend, say Gendry (Joe Dempsie), who hasn’t appeared on the show for a long enough amount of time that his death would’ve been partly plausible, then her decision would’ve been much more palatable. After all, it’s likely that she’ll be on the run forever now isn’t it? Well, maybe not, but either way my point is valid because for the character it will seem like that’s what the decision entails. However, there’s still an outside chance that Arya’s mission was in fact another test designed by Jaqen H’ghar (Tom Wlaschiha). That might seem like a long shot to some people because Arya has already failed two tests and was told that this was her last chance at redemption, but the test I’m referring to wouldn’t be for Arya at all. When you become ‘No One’ you’re supposed to give up your desires and give your life in service of the Many-Faced God; it seems obvious, but to become ‘No One’ you have to lose your identity. You kill who you’re told to kill and you do so without pleasure; that’s all you do. So, with that in mind, it appears as though The Waif’s bloodlust for Arya breaks the code that the Faceless Men live by. If it doesn’t then they’re a wholly inconsistent organisation and the writers have a lot to answer for. I’m not saying that Jaqen would let Arya’s failure go unpunished, because the pair made a deal, but surely being banished from The House of Black and White would be punishment enough. Still, a life has to be paid to the Many-Faced God because as we’ve been told before, only death can pay for life. Lady Crane got to keep hers because of what Arya did, so there’s a “Final Destination” style imbalance in place in the world. With that in mind, either Arya or The Waif has to die to pay the debt, but which one it is should be of no consequence to Jaqen. If Arya dies then she is punished for her misdemeanour, and if Arya kills The Waif then The Waif will be punished for wanting to kill Arya. It’s a win-win situation for the Faceless Men. Obviously, I think that Arya will come out on top, but as I’ve said I expect that afterwards she’ll be banished from The House of Black and White, (probably following a witty line from Jaqen about a girl having a name, only for him to say the name of The Waif – at least that’s how I’d write the scene), or Jaqen would come across as an overly sympathetic character. Elsewhere, in King’s Landing, The High Sparrow regained the upper hand by humiliating Mace Tyrell (Roger Ashton-Griffiths) and Jaime Lannister (Nikolaj Coster-Waldau), which was an interesting scene, but the practicality of it was questionable. When The High Sparrow started speaking it seemed as though Margaery was going to do her Walk of Atonement, which deceived the audience, but in reality it was idiotic because that was never the plan. The only reason that the scene was written and filmed in this way was so that the reveal of The Crown and The Faith’s merging was more surprising, so the writers basically ignored all realism for the sake of their soap-opera make-the-audience-gasp moment. Moreover, the new armour that The Kingsguard were wearing, (which was a merging of The Faith’s symbol and a crown), was stupid because there was no way that the armour could’ve been made in time behind everyone’s back! Making armour in that amount of time, to that level of quality, is almost as nonsensical as building 1,000 ships on a whim… oh, wait, forget I said that and think about dragons. The whole scene felt so convenient and cheap, which again lessened the impact of the one which preceded it. I’m not saying that it was terrible, or that it wasn’t a legitimate surprise, but it required a real suspension of disbelief and in my opinion the storyline isn’t going anywhere. Tommen will probably die at some point anyway, along with Cersei and The High Sparrow; with Daenerys (Emilia Clarke) and her Dothraki horde on the way I fail to see why I should care about the political battle going on inside King’s Landing right now at all. The only positive thing to come out of this whole escapade was Jaime’s removal from the Kingsguard and subsequent mission to Riverrun, because this shift in his story will hopefully inject the character with a bit of personality again. Ever since he got captured by Robb Stark (Richard Madden) he’s gone from strength to strength as a character, but this season he’s stagnated because he’s reverted back to being Cersei’s prettiest henchman. Taking him away from his sister can only be a good thing, and at Riverrun there are a multitude of possibilities which could make him exciting again. The most interesting of these possibilities would be for Jaime to reunite with Brienne (Gwendoline Christie), which seems likely, or with Lady Stoneheart. If he does meet up with Brienne then it will be intriguing to see whether or not he’s willing to help her, because he did make a promise to protect the Stark girls and he actually sent Brienne away to do just that. I’m hopeful that he’ll do something to help Sansa (Sophie Turner), but I’m not entirely sure why he would, given that this would hurt Cersei at a time when she needs her family to support her. The only justification I can think of for him helping Sansa and Brienne would be that somehow he finds out about Cersei and Lancel (Eugene Simon) sleeping together in season one, perhaps from Lancel himself or from The High Sparrow. My dream scenario is that Lady Stoneheart will return, see Brienne and Jaime talking, and kill them both believing that Brienne has betrayed her. It might sound dark, but I think that both of them have had their character arcs now – Brienne killed Stannis (Stephen Dillane) and has also succeeded in helping Sansa, and Jaime could also gain redemption if he helps Brienne, so that would leave them both at a point where they are no longer needed in the story. Don’t get me wrong, I like them both, but with Benjen returning Lady Stoneheart is an all too real possibility, and I want her to start with a bang. Finally, I should address Daenerys’ triumphant/unsettling scene, given that the episode was titled “Blood of My Blood” which clearly relates to our favourite egomaniac Targaryen. Whether or not you take her speech at the end of this episode as one of growth or as one which marks her slow decline into madness is entirely up to you, but I think that either way this was a slightly weird scene. On one hand it was cool that Daenerys gave a variation of the speech that Khal Drogo (Jason Momoa) gave in season one, but on the other it felt like a completely unnecessary moment in the episode. It was very out of place in a fairly restrained hour of television, and it felt as though it had been tacked onto the end of the episode simply because there wasn’t another OMG moment to end with. I think that the writers are toying with the audience, trying to make us all wonder whether or not Daenerys might become the villain of the piece – the fire to Jon Snow’s unrelenting ice – but I don’t think that the scene should’ve been used to end the episode. Surely Sam’s scenes earlier in the episode could’ve been shortened so that one of Bran’s visions could’ve been explored in more detail, thus providing the episode with a more satisfactory conclusion. Seeing an extended version of one of his earlier visions, such as the Mad King’s death, would’ve been far more exciting than watching Daenerys talk about what she’s going to achieve somewhere down the line. Nevertheless, I felt that the positive aspects of this episode outweighed the negatives. This might not be immediately clear from what I’ve written, but the fact that I can speculate so excessively about the future of certain characters after watching this episode means that it achieved what it was intended to achieve. The structure of the episode as a whole was questionable – we spent too long with Sam and Daenerys’ scene felt out of place – but the fractured viewing experience was filled with intriguing moments and moved the story along nicely. “Blood of My Blood” opened up a lot of exciting possibilities for future episodes, so as an episode which was designed specifically for that purpose it was more than acceptable. Game of Thrones, Series 5, Episode 10, Mother’s Mercy, Sky Atlantic, Drogon. This review contains spoilers for the episode and the series. The “Game of Thrones” season five finale was really disappointing. Lots happened, with plenty of cliffhangers to keep fans guessing, but because the showrunners were so intent on leaving things open-ended each storyline felt insignificant. Characters died, but the show can’t surprise us like it used to, and the big name casualties like Stannis (Stephen Dillane) and Jon Snow (Kit Harington) don’t really feel gone. Maybe they are, maybe they aren’t, but the way that those scenes were handled left their deaths feeling less permanent than say Robb Stark’s (Richard Madden) at the Red Wedding. The episode ended up ruining the story arcs that were enjoyable across the course of the season, and although it did a good job of capturing my interest in Dorne and Braavos, it just didn’t live up to expectations. Too many storylines needed resolving, too much had to happen, and in the end everything felt extremely rushed. The season began at a meandering pace, as character arcs were set up in an excruciatingly slow fashion. This strategic positioning took up far too much of the season’s time, meaning that the final episode collapsed under its own weight as too many of the character’s storylines required satisfying endings. None of the storylines were afforded enough time to develop over the course of the season or in this episode, so when they concluded they felt hollow. Never before have I felt so disconnected to the fates of Jon Snow, Arya (Maisie Williams), or Sansa (Sophie Turner), characters who I previously loved as though they were a part of my own social circle. As we flittered around Westeros I couldn’t help but feel frustrated at the fact that we didn’t spend a prolonged period of time with any one character. 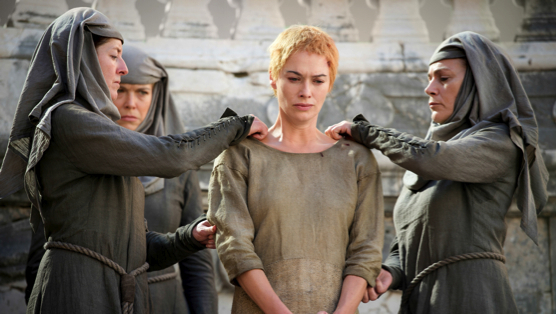 The longest continuous stretch of time spent with a single character was in King’s Landing, as we watched Cersei’s (Lena Headey) humiliation at the hands of The High Sparrow (Jonathan Pryce). We looked on as Cersei transitioned from a proud Queen to a snivelling peasant, which demonstrated just how quickly the tide can change on “Game of Thrones”. However, that scene itself wasn’t particularly entertaining. 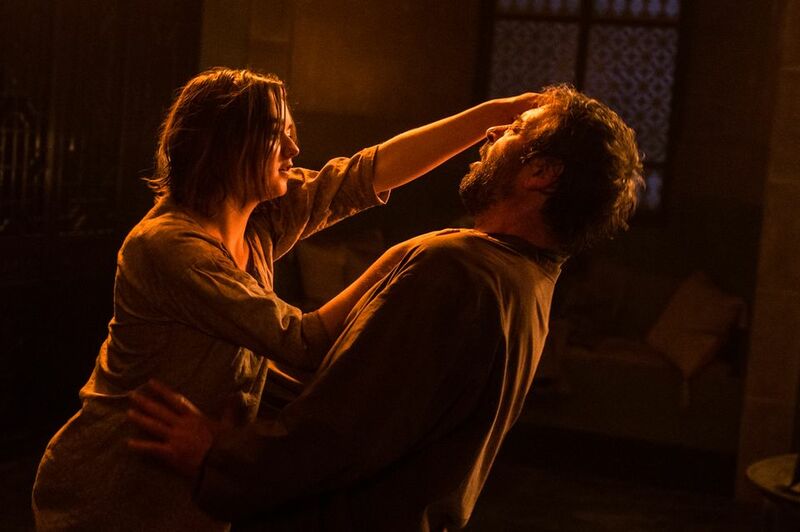 Cersei is an arrogant and hateful antagonist and the source of a lot of pain for fans of the series, so it was impossible to care about her torment in this episode. I wasn’t able to empathise with her because a part of me knows that she deserves everything she gets, but I was also unable to revel in her suffering because her punishment came in such a vile and rotten form. As a result, the scene was dull and took any sense of urgency away from the episode. I enjoyed seeing The Mountain (Hafthór Júlíus Björnsson) back on the show as a zombie-like servant to Cersei, but apart from that I found King’s Landing to be a dull destination in “Mother’s Mercy”. The storylines that have really impressed me over the course of this season finished in infuriatingly anti-climactic ways. Stannis, Daenerys (Emilia Clarke), and Jon Snow all found themselves in dire straits, but by the time the credits rolled we had no idea where their stories were going, or if they’d even make it to season six. 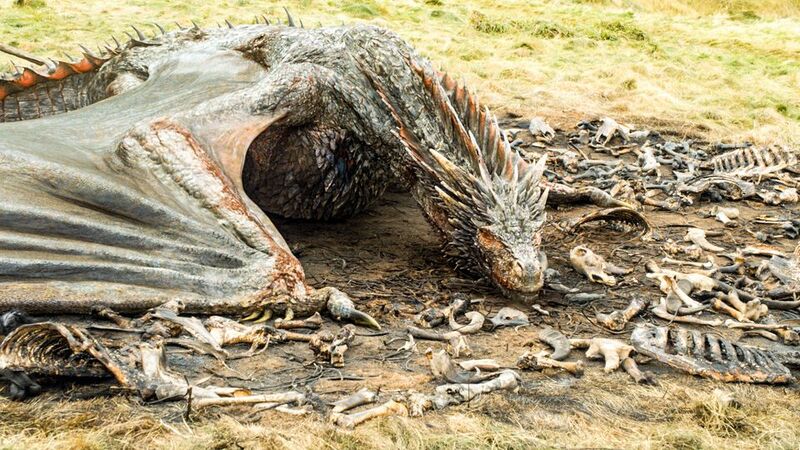 Stannis is presumed dead but we didn’t see his body, Jon is in a similar predicament but Melisandre is at The Wall, and Daenerys is right back where she started, at the mercy of a Dothraki horde, with a dragon that may as well still be in its egg at her side! I would expect Stannis to be dead, because Brienne (Gwendoline Christie) did swing her sword directly at his head, but you never know on this show. We’ve seen Beric Dondarrion (Richard Dormer) die and be resurrected as a result of magic, so we could see something similar given what happened to Shireen (Kerry Ingram) last week. 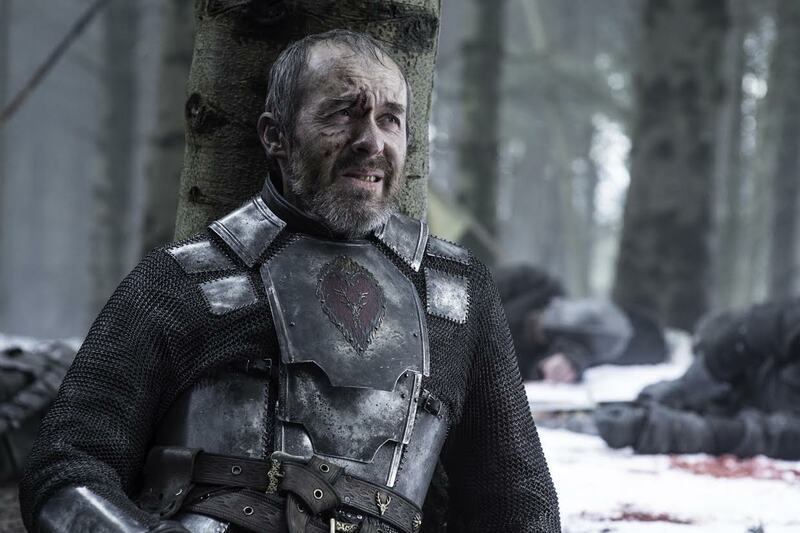 I’d like to think that Stannis isn’t gone, because he had a decent arc this year and I thought Stephen Dillane was doing a really good job. It seems a shame that his life should end so abruptly after he finally got interesting, but that does happen a lot on “Game of Thrones”. Brienne got her revenge on Stannis, which should’ve been enjoyable to watch, but she didn’t take enough satisfaction in the moment to excite me. It was a lacklustre scene that should’ve had a lot more impact. The point of Stannis’ defeat was to show that he isn’t a saviour on the show – he isn’t going to save the world from the White Walkers – but because of how clear they tried to make that (by making his defeat emphatic) the scene shattered the positives of his story over the course of the season. The fact that Brienne missed Sansa’s candle seems quite significant to me, because she isn’t going to know that Sansa escaped Winterfell in the commotion; as far as she’s concerned the situation hasn’t changed, so her role is going to largely stay the same. I’m still holding out for a Lady Stoneheart appearance, because Brienne is culpable if anything bad happens to Sansa now, and it seems like she’s just going to be wandering around in the North for the foreseeable future. Moving on to Sansa’s escape… I didn’t like it. Don’t get me wrong, I’m glad that she’s escaped Ramsay’s (Iwan Rheon) torment and that she’ll be doing something different next year, but I thought her scenes were quite poor. Sansa picked a lock (where did she learnt that? 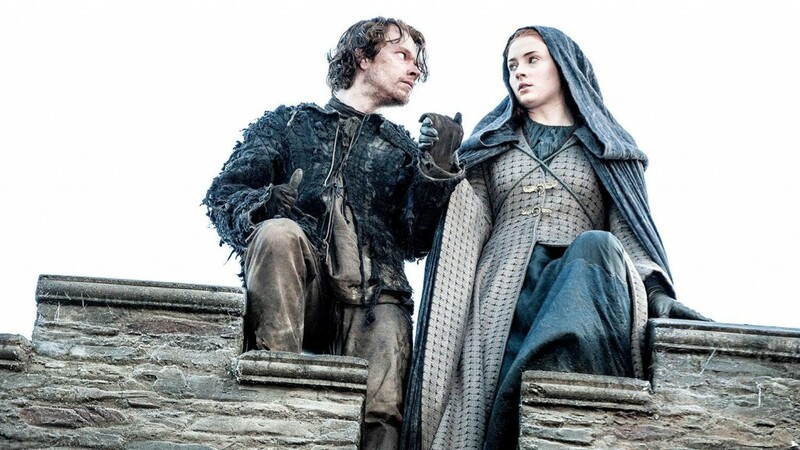 ), then she was saved by Theon’s (Alfie Allen) bravery, which didn’t make a lot of sense because he’s had ample opportunity to help her in the past from equally tragic circumstances, and finally she jumped a life-threatening distance into a pile of snow. It was all incredibly convenient and frustrated me greatly – it could’ve happened in a much better way. Where Sansa will go is exciting – she could go to find Bran (Isaac Hempstead-Wright), but she doesn’t really know where he is, or she could go to The Wall because she knows about Jon. Another possibility is that Theon could take her to his family, but I don’t know why she’d agree to that given what she knows about Theon’s family and how he acted the last time he returned home. My money is on The Wall, but I’m open to suggestions. Game of Thrones, Series 5, Episode 10, Mother’s Mercy, Sky Atlantic, Williams, Maisie; Beattie, Ian as Arya Stark; Meryn Trant. Events in Dorne and Braavos were more exciting this week than they have been in the past, as Myrcella (Nell Tiger Free) met what is likely to be her end, and Arya lost her sight. I loved Arya’s mutilation of Meryn Trant (Ian Beattie) and I also thought that the effects were great when faces were being changed. However, the fact that Arya’s story this season has been so slow meant that I didn’t actually care about her misfortune in the Hall of Faces. All I want is for Arya to move on and cross names off her list, which for now seems pretty unlikely. My least favourite moments in the episode revolved around Daenerys and Meereen, as Daenerys’ allies miraculously survived the aftermath of their Queen’s escape and argued about how they should proceed. My advice would’ve been to get the hell outta Dodge, but instead Tyrion (Peter Dinklage), Grey Worm (Jacob Anderson), Missandei (Nathalie Emmanuel), and Varys (Conleth Hill) will be ruling over Meereen whilst Jorah (Iain Glen) and Daario (Michiel Huisman) go in search of Daenerys. With this set up in place I’m very apprehensive about these arcs moving forward. I don’t care about Meereen and I’m not interested in the Jorah and Daario dynamic – there’ve been better double acts before and I presume that most of their scenes will be a series of fights in which they try to one-up one another to prove their love for Daenerys. Why should I care about that? There are a couple of theories going around about Varys and his role in Meereen, with some people believing that he could be The Harpy. That would certainly spice things up a bit, but I don’t know why he’d have lied to Tyrion about his motives if that is the case. Tyrion wouldn’t have argued if Varys had told him that he wanted to oust Daenerys, so I don’t think these theories are true. Finally, the big moment of season five came and went, as the Night’s Watch lost its commander in an act of mutiny. I thought this scene was alright, and it would’ve been a shock for casual viewers, but for me it was too obvious that it was coming. I’ve been cautious of Olly (Brenock O’Connor) all season and Alliser (Owen Teale) was clearly up to something, so this wasn’t much of a surprise. I liked that Alliser used Benjen (Joseph Mawle) as the ploy by which to get Jon out in the open, but apart from that I thought the scene lacked a bit of impact. I wanted the scene to be a bit more brutal, and Brenock O’Connor’s acting when he dealt the final blow was a bit weak. I don’t think that Jon is gone, and I’m certainly not alone on that front, but I’m not sure exactly how his resurrection will occur. He’s dead, I don’t think there’s any doubt about that – no one is going to stop him succumbing to his wounds. Still, with Melisandre (Carice van Houten) at The Wall it seems as though there’s a return on the cards. She needs a new champion for The Lord of Light, and if she knows about his parentage he might be the perfect candidate – this is cool, but it makes the entirety of Stannis’ story feel like a device to get exposition across for Jon’s future role. Another possibility is that he’ll be resurrected by The Night’s King – that would certainly give us an inside look at the White Walkers – but whether or not that would work remains to be seen. The next book is called “The Winds of Winter” though, so clearly the White Walkers will play a big part in the narrative. Having Jon on the side of the Walkers would be incredible, so I wouldn’t mind, and it would also make it a lot easier for the showrunners to have The Wall brought down. Although I enjoy speculating about the future of the series, and this episode did open the floor up to such a discussion, it didn’t resolve anything and felt anticlimactic. All in all, “Mother’s Mercy” was a bland and frustrating “Game of Thrones” finale, capping off a season that has failed to live up to my high expectations. There were cliffhangers and character deaths galore, but nothing was properly concluded and many of the character’s fates were left up in the air, leaving me with a very sour taste in my mouth.